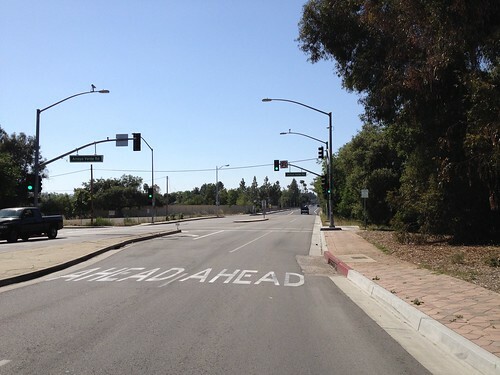 This one stretch of road, 528 feet long, merges 35+ mph cars with bike riders heading to the newly striped York Blvd. bike lanes. 528 feet, .1 miles, 160.9 meters. Anyway you write it, the distance between the newly striped York Boulevard bike lanes in Los Angeles and the bike lanes on Pasadena Avenue in South Pasadena is a full measure of a failure to communicate. The York bridge has been a no-mans land for anyone on foot or on a bicycle for several decades. Poor street design has kept the communities of Highland Park and Garvanza in Los Angeles culturally separate from South Pasadena. The installation of a safe bike lane across the York bridge has the potential to turn South Pasadena’s derelict commercial corridor, and the lonely Ostrich Farm development, on Pasadena Avenue around. Those same bike lanes can help bring weekend bicycle tourists, and weekday bicycle commuters riding through to Downtown LA, into Highland Park’s many cafes and shops. Most importantly of all, Garvanza residents would only be a short bike ride away from beloved Trader Joes on Mission in South Pasadena. So why didn’t this 528 feet of Pasadena Avenue have any amenity for bike lanes connecting to Los Angeles? It wasn’t helped by the City of South Pasadena’s decision to fire the talented Dennis Woods, the former Transportation Manager for the small city. Woods is responsible for the quick turnaround in bike planning, projects, and state bike project aid that came to an abrupt end with his sacking in October of 2013. Pasadena Avenue should have had it’s four lanes narrowed from 11 feet down to 10 feet, taking the spare space and adding it to a westbound bike lane feeding into the York Bridge. 300 feet of Pasadena Avenue should have lost “car parking” (which I have never seen used in the 10+ years I’ve passed by this stretch of road) to connect the bridge with eastbound bike lanes laid down under Dennis Woods’ supervision a few years ago. The bike lanes across the bridge are barely an amenity, and serve more as a gutter lane for broken down cars than as a safe means of travel between South Pasadena and Los Angeles. They do represent a brightening flame of community connection – but that flame is still weak. Two car lanes should have been removed on the bridge. A buffered lane on each side of the bridge should have been installed. Traffic volumes leading up to the intersection of York and North Figueroa are shockingly low. I am not going to address the huge design flaws of the bike lanes at the intersection of York and North Figueroa. I’ll leave that to the LAPD responding to what I am sure will be numerous fresh car vs. everything collisions. Just a short gap in lane striping keeps LA’s new bike lanes disconnected from South Pasadena. So, 528 feet. The full measure of professional incompetence. The York Boulevard bike lanes are a huge leap forward from where we were, but still come up dramatically short. The good news is that the money required to restripe 528 feet of Pasadena Avenue is quite a small sum. The political will and the ability of two dysfunctional city planning apparatuses to execute that restriping is what has got us here, and has me still worried for my life, and the fate of our civilization, when riding between the two cities.